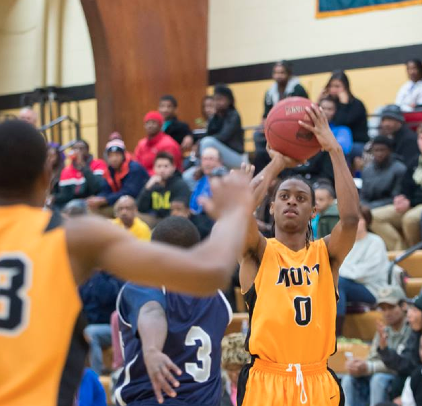 Mott sophomore Myles Busby scores two of his 18 points Monday night in Mott’s win over Owens (Ohio). FLINT, Michigan — Mott head coach Steve Schmidt had a week and a half to get his team focused for Monday night’s big game versus Owens (Ohio). The Bears had a strong start to their season, but it was no secret that Schmidt was displeased with his team’s effort on the defensive end heading into Christmas break. Schmidt got back to the basics in practice, challenging his team to take more pride in stopping the ball. He reacquainted them with his expectations, and Monday night was their first chance at redemption. Mott (9-2) responded in emphatic fashion, blowing out the Express, 97-62. And, if the score fooled you, understand that Owens (12-4) isn’t some out-of-state whipping boy. The Express already have an impressive resume of wins over some of the better teams in Michigan, including Wayne County, Kalamazoo Valley and a 41-point blowout win over Mott’s next opponent, Henry Ford CC. J.D. Tisdale, now a freshman at Bowling Green, put one on former Oakland CC forward Ugochukwu Njoku in a win over UDM. No. 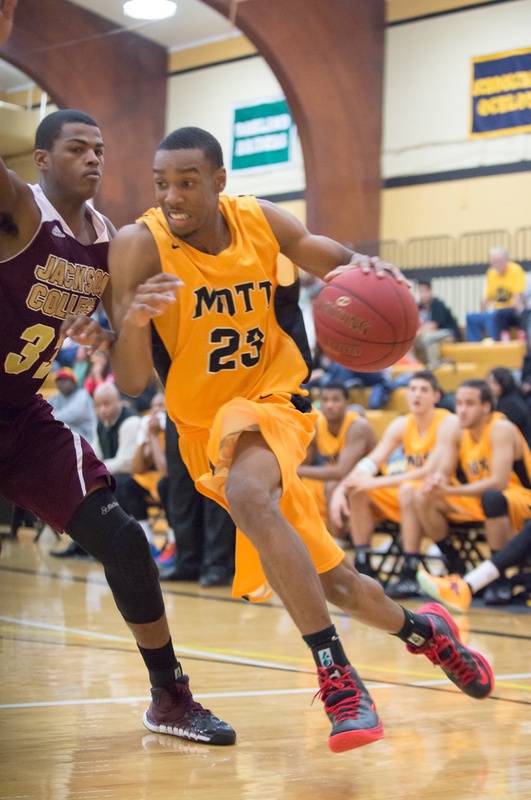 7-ranked Mott lost its second game of the season Wednesday night, on the road against Kalamazoo Valley (KVCC). The Bears’ struggles on the defensive end caught up to them once again, falling 87-82. Mott led 33-31 at the half but surrendered 56 points in the second half. Sophomore Malik Albert led all scorers with 28 points and freshman Marcus Johnson scored 15. Sophomores Myles Busby and Jamal Reynolds added 10 points and eight rebounds apiece. KVCC had five players in double figures led by Tyler Oliver and Jaylen Larry with 14 points each. Larry is a Flint Carman-Ainsworth graduate. Point guard Davonte Harris scored nine points with five rebounds and played at a high level for almost the entire game. KVCC will fight with Lansing also season for supremacy in the MCCAA’s Western Conference, so it’s a bit of a stretch to call this one an upset — Mott has split with both programs this season. That said, once Mott’s second-scorer and top forward, Ruston Hayward, returns to the lineup, Mott fans should see a much-improved group. The Bears will return to action at 7:30 p.m. December 30 at home versus Owens, another one of the better teams in the Midwest. Former Flint Northern standout Tez Thomas is one of our 14 players to watch in 2014. 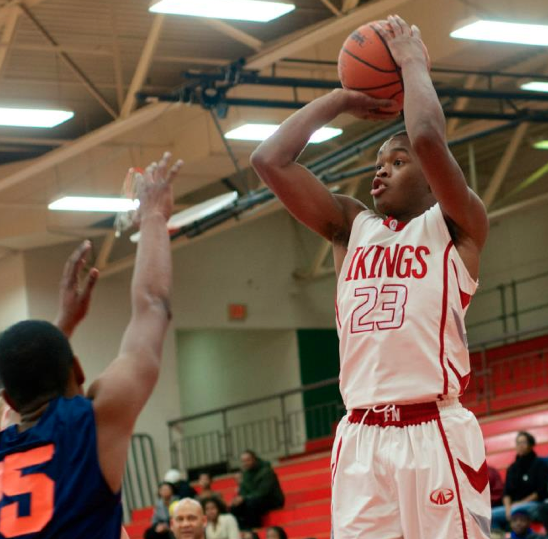 Thomas transferred to Flint Beecher after Northern earlier this year. With the graduation of the Flint area’s class of 2013, among the top classes for basketball talent in the area in the last decade, a market correction is certainly in order. Don’t get me wrong, what’s left after the departure of Mr. Basketball (Monte Morris), Denzel Watts, J.D. Tisdale, Bart Williams and company isn’t exactly chopped liver — there are some lesser-known kids out there this season who can really go. Here are 14 players you should probably make a special trip to see this season. You should know most of these guys, but a few names might surprise you. One name that is missing is would-be senior Kaylin Johnson, a young man with high-level potential who sat out most of his junior year at Flint Northern last season. He is currently in a correctional facility after a run-in with the law over the summer. He’s the most physically gifted player in our area. Here’s hoping he can turn his life around before it’s too late. Cam Morse, senior, Flint C-A (Player of the Year): Morse, a 6-3 combo guard, has evolved into a better all-around player than his D-1 counterpart from last seasons, Denzel Watts. Morse leans on skill more than brawn, and will put up numbers in the SVL South that will turn more than a few heads (he already has games of 29 and 30 points) this season. Malik Young, senior, Flint Southwestern: Young certainly deserves consideration for the top senior in the Flint area this season, though his playing status is unclear after a preseason knee injury has kept him on the sideline. He’s small, maybe 5-10, but he has a quick burst and lives in the lane. He has been a difference maker at SWA for three years and, without him, the Knights have little chance of making a postseason run. Young will find out this week his playing status for the season. Jake Daniels, Holly, junior: I saw Daniels for the first time when he was in the 8th grade. He was the smallest player on the floor, at the time, but he competed like he was 6-7. Daniels can play either guard spot and is under the radar after sitting out his sophomore season. Daniels started as a freshman at Grand Blanc before transferring to Holly to play for Lance Baylis and the fun-n-gun Bronchos. Jaire Grayer, junior, Flint Southwestern: The son of former NBA player Jeff Grayer is probably the best college prospect on this list. At 6-4, he can take his defender inside and out. The Knights will lean on Grayer and fellow junior Neshua Wise (who really should also be on this list) for scoring in the absence of Young and, of course, nationally-recruited sophomore Miles Bridges, who is now playing at Huntington Prep in West Virginia. To be the best player in his family would be difficult, but he could certainly be as good or better than his similar-sized older brother Kevin, who was a stud at the JUCO level and all-conference at Midwestern State University. After nearly three hours on the road to Jackson Saturday in the midst of the season’s first winter storm, no. 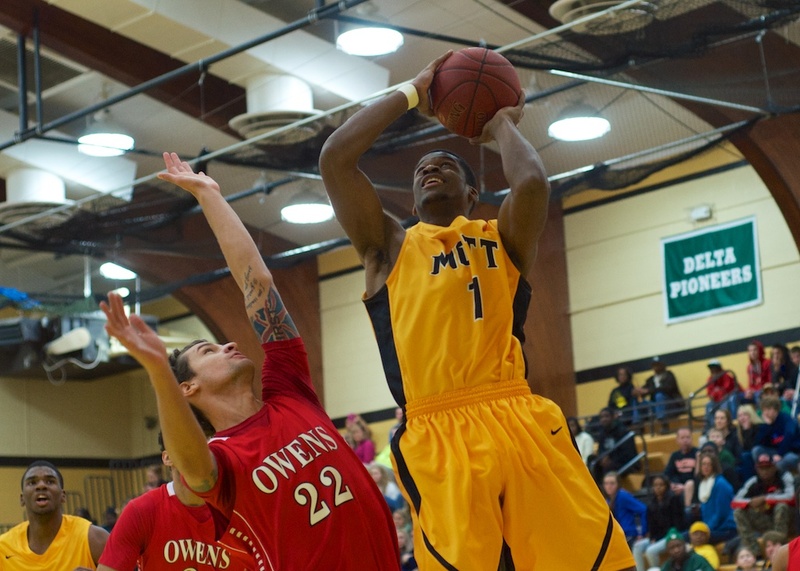 11-ranked Mott grounded the Jets, 93-66. The win was Mott’s fifth consecutive, a streak that will be tested Wednesday night on the road at (9-3) Kalamazoo Valley — arguably the top team in the MCCAA’s Western Conference. Mott (8-1) struggled early, leading Jackson 29-26 with eight minutes left in the first half. The Bears finished the half on a 21-7 run to lead 50-33. Mott freshman Malik Albert scored 20 of his game-high 29 points in the half. Albert still leads the nation in scoring at 29 points per game. All told, five Bears scored in double figures and the team combined to shoot 24-for-28 from the foul line. Sophomore Myles Busby scored 14 points with 10 rebounds and four assists. Sophomore Jamal Reynolds scored 13 points on 5-for-6 from the field. Reynolds, a Toronto product, is leading the nation in field goal percentage at nearly 80 percent. Freshmen Marcus Johnson and Lorenzo Collier added 12 and 10 points, respectively. Mott sophomore Malik Albert is getting attention from numerous D-1 schools. The combo guard from Detroit is averaging 29 points per game this season. It’s hard to ignore. 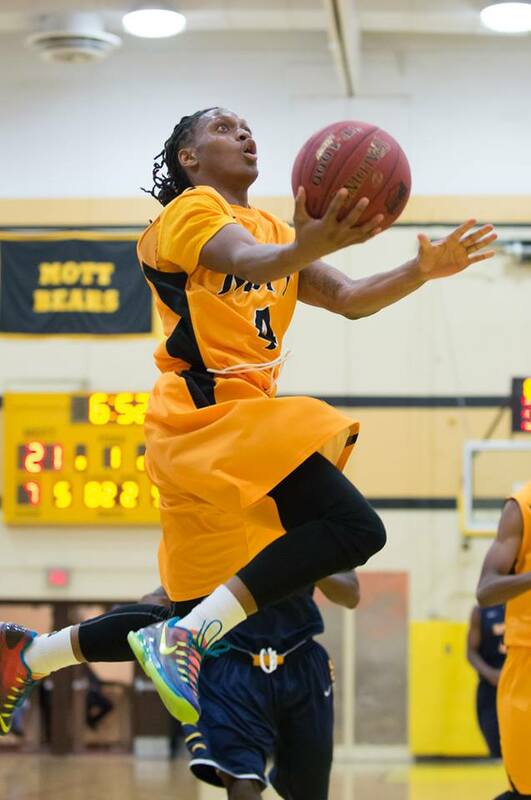 So far this season, it has been difficult for another player in the MCCAA to get a word in on Mott sophomore Malik Albert. His game is speaking for itself, these days, with every sentence and quotation ending in an exclamation point. Albert is the silent assassin, killing them with coyness – but killing them just the same. FLINT, Michigan — Wednesday night’s tilt at Ballenger Field House didn’t have the high drama of the first meeting between rivals Lansing and Mott. The Bears fell on a rebound putback at the buzzer in the Capital City last month. It was Mott’s first loss to the Stars in three years. This time around, Mott built a 24-point lead in the second half; from there the Bears held on for dear life, winning 92-83. No. 10-ranked Lansing (9-3) has three losses on its record, but two of them are by forfeit. This was the first time the team had truly tasted defeat this season. Mott was able to pull out the victory in spite of the absence of second-leading scorer Ruston Hayward (knee) and a pedestrian effort from Malik Albert, currently the leading scorer in the nation at this level. Lansing, smartly, keyed on Albert throughout the game, holding him to 21 points on 6-for-19 from the field. FLINT, Michigan — Welcome to Flint, Jamal Reynolds. For the first time this season, Mott fans caught a glimpse of the athletic, energetic and high-impact transfer they had been expecting since day one. Jamal Reynolds, a bouncy 6-5 small forward from Toronto, turned in his best performance of the season as Mott crushed Jackson Wednesday night, 101-64. Reynolds came off the bench to score 14 points on eight shot attempts with 12 rebounds and four assists. He turned heads not long after he entered the contest for the first time, driving the baseline for a right-handed slam. His performance all but assures him some more tick as the season progresses. 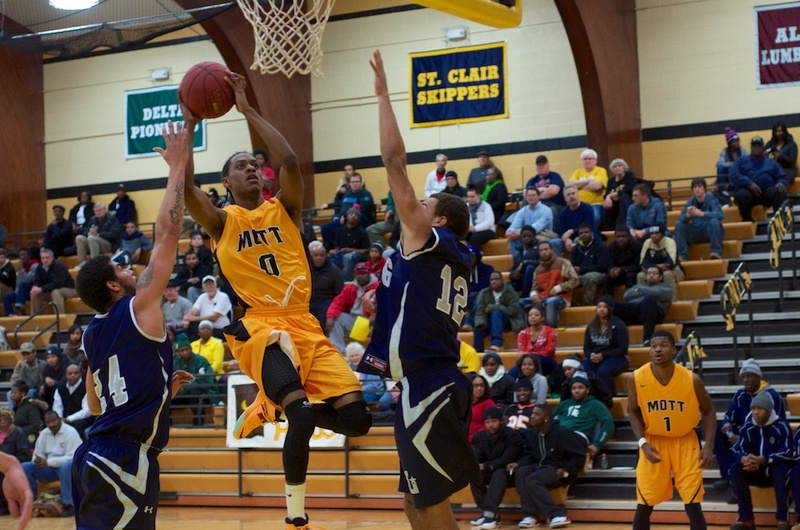 Malik Albert, Mott’s leading scorer in every game this season, led the team with 21 points, five rebounds, four assists and three steals. Albert, who had been averaging 31 points per game, had the play of the game in the second half. The uber-athletic 6-2 combo guard got loose on a breakaway and took a defender with him for a thunder dunk and one. Mott (6-1) led by 22 points in the first half before Albert and the starters took a rest in the half’s final few minutes. Jackson was able to cut into the lead to trail by 17 at the break. Mott added to its lead in the second half, in spite of an awful shooting performance from the free throw line. The Bears, for the second time this season, actually shot better from the field (61 percent) than from the charity stripe (49 percent). Mott sophomore Myles Busby turned in another impressive all-around performance. The rangy stat stuffer scored 11 points with six rebounds, four steals and two assists. Ruston Hayward and Chester McFadden added 14 and 13 points, respectively. Jackson (4-3), for the bulk of the game, suffered at its own hand with lackluster shot selection. The Jets attempted nine shots from beyond the arc in the second half alone, and failed to make one. The team shot 32 percent from the field in the game. Jackson was led by guard Jaiern Hunt who scored 14 points with four steals. Mott has a week to prepare to make amends for the lone blemish on its record this season. The Bears will host Lansing next Wednesday night at 7:30 p.m. The Bears lost to the Stars in Lansing two weeks ago on a rebound put-back as time expired.